4K SUHD JS8500 Series Smart TV, 4K SUHD JS850D Series Smart TV, 4K SUHD JS9500 Series Curved Smart TV, 4K SUHD JS9100 Series Curved Smart TV, 4K SUHD JS9000 Series Curved Smart TV, etc. How to put Blu-ray movies onto USB Flash Drive for playback on Samsung 4K SUHD TV? Step 1: Launch the highly recommended our top blu ray ripping software. 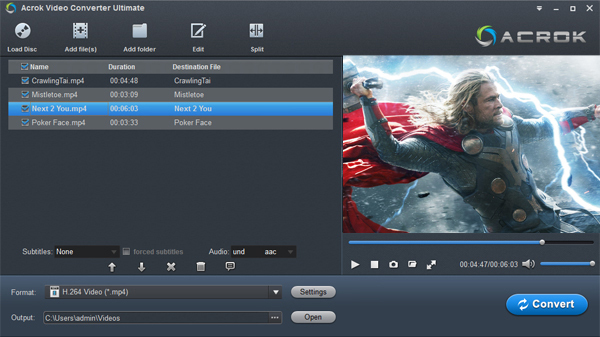 Insert your Blu-ray movie to disc drive, and click “Load Disc” button on Acrok Video Converter Ultimate interface to load Blu-ray from BD drive; it also support importing DVD discs, Blu-ray ISO and Blu-ray folder. Step 2: Select a format for conversion. To convert Blu-ray to MP4 video, press on “Format” and choose “Common Video>>H.264 MP4 Video (*.mp4)” format. You can also choose MOV, AVI and other format for your Samsung 4K SUHD TV or portable devices. Step 3: Start ripping Blu-ray movie to MP4. After conversion completes, press “Open” to locate resulted MP4 files, copy and transfer the converted video to a USB flash drive or SD card and attach it to your Samsung 4K SUHD TV or others. Now, you can Play Blu-ray contents through USB Flash Drive without troubles. After read this guide, you can easily get your Blu-ray contents through USB Flash Drive for playback and you don’t need a Blu-ray player connected to Samsung 4K SUHD TV, it is so convenient.